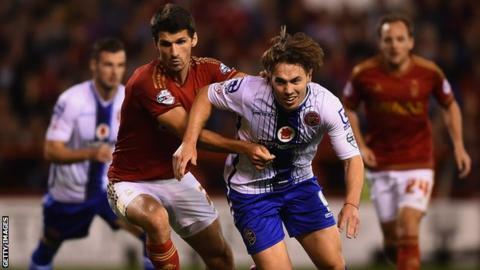 Tom Bradshaw's hat-trick earned League One side Walsall a shock win over Nottingham Forest in an incredible Capital One Cup first-round tie. Bradshaw scored two quick first-half goals but Tyler Walker - son of former Forest defender Des - made it 2-1 with a tap-in before half-time. Romaine Sawyers fired home Walsall's third with 11 minutes remaining. Forest substitute Michail Antonio's double seemed to have forced extra-time but a Bradshaw penalty secured victory. Antonio smashed home his first from 25 yards with nine minutes to go after a fine run and then backheeled the equaliser in the 90th minute. But Bradshaw was felled by Kelvin Wilson in the fifth minute of injury-time and then netted from the spot to dump the Championship side out of the competition. Bradshaw's close-range early double had put Walsall in control against a lacklustre home side, both goals coming from breaks down Forest's left-hand side. A change of formation saw the hosts drop their diamond formation for a more regular 4-4-2 and the improvement saw Walker mark his full debut with a goal when he slid the ball home from a yard. Walsall regained their composure after the break and, when Sawyers smashed in a third away goal, the win looked a formality. Antonio then struck back but Bradshaw's calm spot-kick ensured an upset. Nottingham Forest manager Dougie Freedman: "I've finally reached the end of my tether [with some of the players]. I am bitterly disappointed. "There is a lack of individual desire at the moment to keep the ball out of the back of the net and it has cost us once again. It is very difficult to concede four goals and win a match. "There has got to be changes in personnel, simple as that." Walsall hat-trick hero Tom Bradshaw: "I knew it was going in. The last penalty I took, in pre-season, hit a post - I thought to myself 'you can't miss two in a row' and luckily it went in. "For Forest to score those late goals, it was hard to take, but I think it showed the character of the lads to come back and score the winner. "You saw the passion from the players and it was a great team performance." Match ends, Nottingham Forest 3, Walsall 4. Second Half ends, Nottingham Forest 3, Walsall 4. Goal! Nottingham Forest 3, Walsall 4. Tom Bradshaw (Walsall) converts the penalty with a right footed shot to the bottom right corner. Penalty conceded by Kelvin Wilson (Nottingham Forest) after a foul in the penalty area. Penalty Walsall. Tom Bradshaw draws a foul in the penalty area. Attempt missed. Oliver Burke (Nottingham Forest) right footed shot from the right side of the box is close, but misses to the right. Attempt missed. Tyler Walker (Nottingham Forest) right footed shot from a difficult angle on the right is close, but misses to the right. Goal! Nottingham Forest 3, Walsall 3. Michail Antonio (Nottingham Forest) right footed shot from very close range to the bottom left corner following a corner. Corner, Nottingham Forest. Conceded by Rico Henry. Corner, Nottingham Forest. Conceded by Anthony Forde. Attempt missed. Dexter Blackstock (Nottingham Forest) header from the centre of the box is close, but misses to the right following a corner. Corner, Nottingham Forest. Conceded by Neil Etheridge. Attempt saved. Michail Antonio (Nottingham Forest) right footed shot from outside the box is saved in the bottom left corner. Substitution, Walsall. Jordan Cook replaces Kieron Morris. Anthony Forde (Walsall) wins a free kick on the right wing. Eric Lichaj (Nottingham Forest) wins a free kick on the left wing. Goal! Nottingham Forest 2, Walsall 3. Michail Antonio (Nottingham Forest) right footed shot from outside the box to the top right corner. Assisted by Daniel Fox. Goal! Nottingham Forest 1, Walsall 3. Romaine Sawyers (Walsall) right footed shot from the centre of the box to the high centre of the goal. Substitution, Nottingham Forest. Michail Antonio replaces Jamie Ward. Substitution, Nottingham Forest. Oliver Burke replaces Chris Burke. Corner, Walsall. Conceded by Eric Lichaj. Attempt missed. Chris Burke (Nottingham Forest) left footed shot from outside the box is high and wide to the left. Substitution, Nottingham Forest. Dexter Blackstock replaces Jamie Paterson. Corner, Walsall. Conceded by Kelvin Wilson. Foul by Chris Burke (Nottingham Forest). Hand ball by Rico Henry (Walsall). Attempt missed. Jamie Paterson (Nottingham Forest) right footed shot from a difficult angle on the right is close, but misses to the right. Attempt missed. Romaine Sawyers (Walsall) right footed shot from outside the box is too high. Attempt blocked. Kieron Morris (Walsall) right footed shot from the right side of the box is blocked. Substitution, Walsall. Romaine Sawyers replaces Adam Chambers because of an injury.